But it was time to push on. I had my friend TW working as ground support. (He made sure there were hotel rooms available in the towns we were landing, checked to see which FBO had the best reviews and so forth. All things I can do if I have a decent WiFi connection, but when you are hopping through the Southwest it is a lot nicer to have someone doing it from a desktop and sending little queries and updates to your iPhone.) 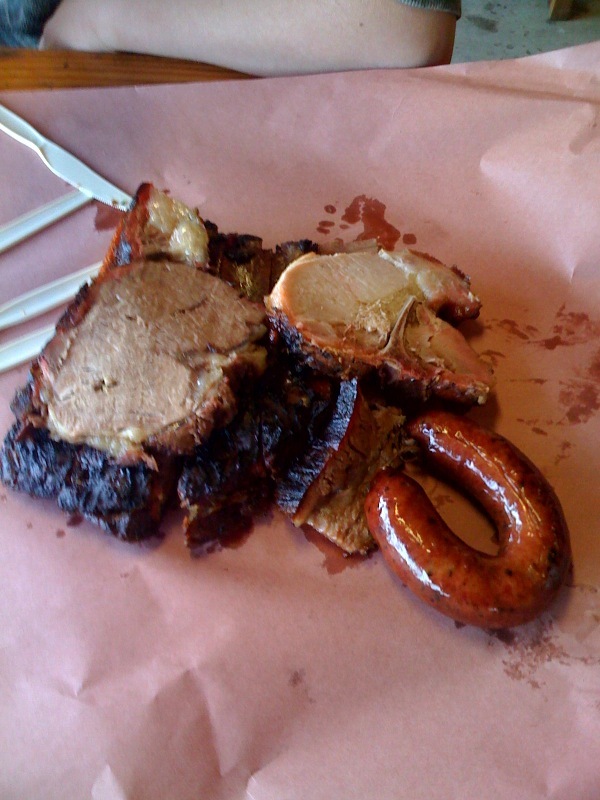 He said that Lockhart, TX was the place to stop for the best BBQ in Texas. Right now I’m in the plane leaving Texas. The best food I had in Texas was probably my chocolate pancake. 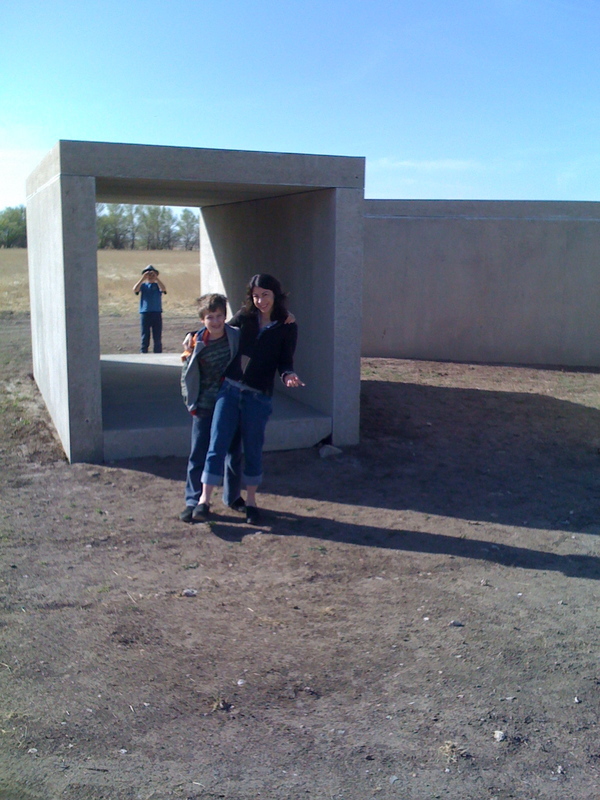 We also got to see some art by the minimalist Donald Judd. In the town Marfa, we watched a lot of TV. We also got to see some hawks in Marfa. The flight to Lockhart was not as bumpy as the previous day, but I didn’t really appreciate the landscape. I think I am more of a New Mexico aficionado, rather than a Texas hill country sort. I would like a private airstrip and a chance to build a house in either desert, but I feel more drama a little further north. It doesn’t help that a lot of the land we flew over was pockmarked with drilling rigs and the network of dirt roads necessary to service them. Nell and I discussed what that life must have been like, or is probably still like. We flew abeam of the Kerrville airport and heard a Mooney talking to the approach controller after leaving the factory field. That was cool. Around there Nell pointed out that the patterns of the green scrub on the grey desert looked sort of paisley. There were fascinating places where a line of trees (out in the middle of nowhere) would follow what must have been a drainage line. Arrow-straight, marching along as if planted by rabid French gardeners, they jumped out of the otherwise chaotic curves of the natural landscape. Lockhart is sort of between Austin and San Antonio. It was just past San Marcos, TX, which looked like a little college town. The weather being reported from Lockhart favored runway 19. The nearby airport reported wind one hundred eighty degrees off of that, which agreed with what I was seeing at a couple thousand feet above the ground. I announced for one-nine, but flew over the airport and checked the wind sock. The reporting equipment must have been stuck or something. I entered the downwind for runway three-six instead, landing into a fifteen knot wind, gusting to twenty, on a three thousand foot piece of asphalt. If we had landed in the wrong direction that would have been a difficult stop at the end. A good reminder to always check things visually and to never blindly rely on the computer voice telling you about the weather at the airport. Finally, we are in Lockhart, Texas. The barbecue is coming soon and I am getting hungrier and hungrier. The FBO (really just a tiny operation) was incredibly nice. They gave us a rundown on the various BBQ options and we headed off for one of them in their crew car (a big old suburban SUV, which Dexter loved bouncing around in). I bow to Rudy for the review of the meal. After lunch (and a stop at Dairy Queen; Texas has more DQs than any other region in the United States) we checked the weather, fueled the plane and let the boys run around a little. There was a thunderstorm that was headed toward New Orleans. We didn’t want to outrun it on our way east. We planned a fuel stop in Lafayette, Louisiana, so that if we were going to be on the tail end of the weather into New Orleans we would land at Lafayette and just wait it out a little bit. The reviews of the FBO at Lafayette made it sound comfortable enough for the boys to play Magic while Nell and I checked our email. Our tailwind was still with us, and it pushed the weather out into the Gulf. We followed the Mississippi into New Orleans, flying along the I-10 (which we had followed as we left Santa Monica), and hooking out along the southern edge of Lake Pontchartrain. The airport’s tower was closed, so the approach controller let us switch to the CTAF and we self-announced. The FBO was not as professional as you might have expected in a big city, but I believe the airport is probably still recovering from Katrina. The FBO was in a double-wide and was surrounded by chain link fencing. We have escaped Texas and we are now in New Orleans where we just had dinner. We are in New Orleans and loving every moment of it. I had a fantastic batch of calamari in a jazz cafe. Then, a storm started. After getting rained on for a couple minutes, we got to our hotel and are now watching a South Park episode.